Torremolinos is one of the most popular tourist destinations in Costa del Sol, with hotels ready to cater to your every need. Its well-kept beaches, large variety of entertainment and lively nightlife make it a great place to stay on your visit to Andalusia. The area around Torremolinos has been populated since Neanderthals lived here some 150.000 years ago. It was later occupied by Phoenicians, Romans and Moors, who gave the town its name after a special type of mill (“torre” means tower and “molino” means mill). Torremolinos remained a small fishing village, however, until the world-famous Hotel Pez Espada was built here in 1959. The pleasant climate and beautiful beaches of Torremolinos, as well as the luxury of Hotel Pez Espada, attracted celebrities like Frank Sinatra, Ava Gardner and Orson Welles. Old buildings were torn down in favour of new hotels, restaurants and shops that would change the town for ever. 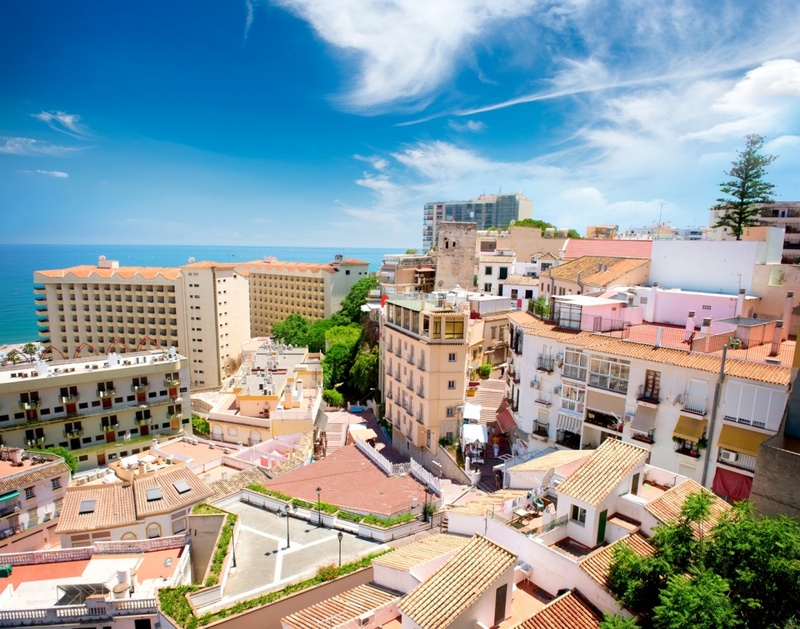 Torremolinos has now gone from an overbuilt tourist resort to an attractive destination, with its heritage as a fishing village still visible in some places. Seaside Torremolinos is packed with hotels, apartment blocks, bars and restaurants that can become very busy during summer. La Carihuela is one of the most popular beaches and has a seafront lined with shops and restaurants. Neighbouring Bajondillo beach has an excellent sea promenade and is easy to reach from Torremolino’s main street by a steep flight of stairs. The Montemar beach has plenty of green areas, and the Saltillo beach runs all the way to the Benalmádena marina. Beaches are more quiet the further east you get, and most offer a wide variety of seaside sports like volleyball, windsurfing, paragliding and pedal boats.You are likely to find restaurants with any kind of food in Torremolinos, but the local speciality is seafood served in the many chiringuitos, beach bars. La Carihuela district is the original fishing village and is well-known for its excellent seafood in restaurants on and around the beach. You can also find plenty of restaurants in the old part of town, in and around Calle Quintana Rosado. Torremolinos is famous for its great and bustling nightlife, which attracts visitors from all over the coast and the rest of Andalusia. Spain’s first gay bar opened here in 1962, and the town still has plenty of bars and clubs catering to the gay community. Head to the main street, Calle San Miguel, or the area around Plaza Nogalera for some of the best clubs on Costa del Sol. Find information about selected Hotels, apartments and rooms in Torremolinos to choose the perfect place for your accommodation.